Our most-read driving tip of the year explains how to tweak your setup to improve your game. Of all the instruction lessons GOLF dished out in 2018, one tip stood above all others as our most-read driving tip this year. It comes via our Equipment expert Mike Chwasky, who offers up tips on tweaking your driver setup to fix your game. INSTANTLY REEL IN A HOOK OR SLICE Adjustable hosels are a fantastic technological advance in driver design, but they remain an enigma to most recreational players, many of whom chose to simply "set it and forget it." What a waste. Honestly, it's not all that complicated, even for intrepid adjusters. But hey, we're all for compromise here. In the spirit of simplicity, think of your adjustable hosel as a one-trick pony, and experiment with setting the face open or closed. According to most fitters, the face angle setting will exert the most dramatic effect on your drives anyway. Here's the general rule: Set the face to slightly closed to fight a slice. The closed setting actually adds loft, helping you launch the ball higher and turn the face over. Conversely, if you want a more penetrating trajectory or want to negate a hook, turn the face in the opposite direction until it appears slightly open at address. This will create a lower ball flight and a slight fade bias. It's that simple. CREATE OPTIMAL LAUNCH WITHOUT THINKING A lot of players think a low or medium tee height will help them catch the ball in the middle of the clubface, yielding the fastest ball speeds and the most yards. Enjoy your parting gifts, Player One. Truth is, if you really want to get maximum distance out of your driver, you need to tee the ball high with at least half the ball resting above the topline of the clubhead. Fix Finder Fix of the Week: How high should I tee up my golf ball? A high tee position encourages you to strike the ball with an ascending blow (Bubba Watson swings up as much as seven degrees at times). Disciples of ascension create high launch and low spin, which everyone knows leads to max distance. Then there's the vertical gear effect you get when you strike the ball a bit high on the clubface. On high hits the clubface actually flexes toward the sky, adding more loft and further reducing spin. It's a double whammy of everything you need to create optimal launch. CONSISTENTLY POUND THE SWEET SPOT Despite swinging upwards of 125 mph, most pros remain balanced and in control. Why? Talent. Oh, and most have also dialed in their ideal shaft length. While the average driver shaft used by recreational players measures around 45.5", pros typically go a bit shorter, somewhere between 44" and 44.5". 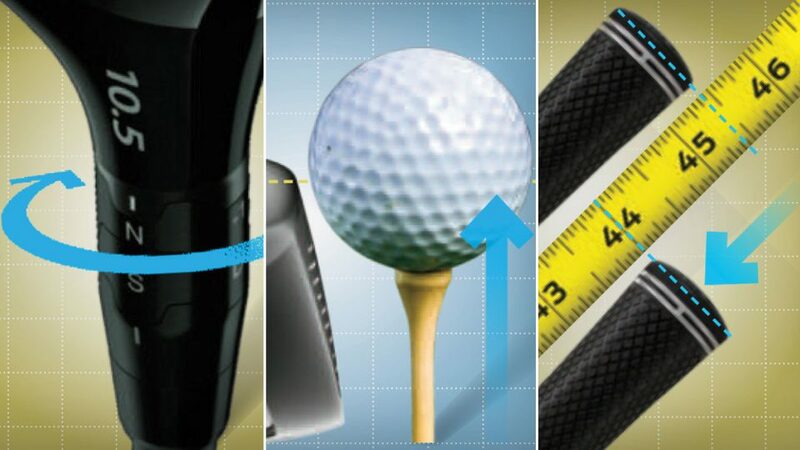 The difference might not seem like much, but it can actually have a huge effect on the quality of your ballstriking, confidence, distance and dispersion. The best way to deal with this issue is to get fitted for your driver, but you can also experiment with different shafts at a demo day. You should consider your swing profile, too. Aggressive swingers tend to perform better with shorter shafts. If you're Dr. Smooth, on the other hand, it's likely that you'll feel better at a longer length. Standards exist to fit the widest range of golfers possible, but that doesn't mean they necessarily have to apply to you.